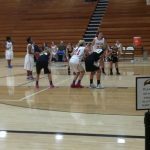 The varsity girls’ basketball team lost last night to Corunna 49-27. It was the first game for both teams. The Bulldogs were down 16-8 at the half. Jalysa Bard led the Bulldogs in scoring with 11 points. Brooke Beaune and Emily Somerville had 6 points each. Maycee Robinson and Gabby Trudell had 2 points each. Sophomore Meg Darmofal and Senior Cassidy Hass competed in the Division 2 State Finals this weekend at MIS for the Bulldogs. Meg finished 8th overall with an 18:15, earning All-State recognition for the second consecutive year. Cassidy finished 111 overall with a 20:02, she was All-State 2 years ago as a sophomore. Nice job ladies!